Migration Brewing is holding a birthday party on Feb 14th to celebrate their fifth year of brewing. Located at 2828 Northeast Glisan Street, Migration has really become an institution in the neighborhood. So this Valentine's day join the party and try one of their three specialty beers that will be on tap in addition to the normal tap list. Also, DJ Casta will be playing old school hip-hop, soul and funk all night. How time flies when you’re having fun. To think 5 years ago we were digging trenches in a heatless building with only a dream guiding the way. In those 5 years we have gone from brewing 250bbl a year to over 1400bbl. We started with the hope our community would support us to having the opportunity to donate thousands of dollars to countless organizations throughout Portland. We were 4 friends with a vision who have brought our experiences together to create a neighborhood-gathering place. On February 14th 11AM we will hold a celebration for lovers and beer lovers alike. We will be offering brewery tours and specialty beer samples in the brewery from 11AM-4PM. We will be tapping a variety of beers old and new, a number of which have been aging for over a year. 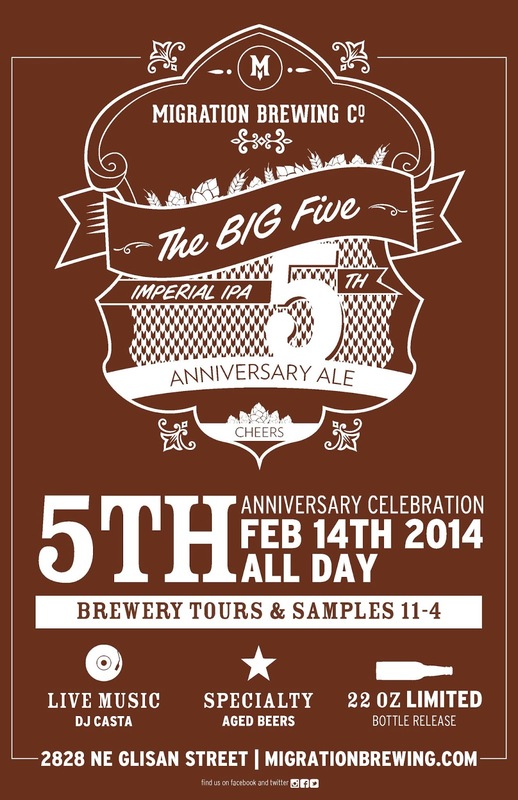 We will also be releasing our new Imperial IPA The Big Five, which will be available in 22oz. bottles and draft. To close out the night we will have the amazing DJ Casta spinning old school hip-hop, soul and funk. We would like to thank everyone for the continued support over the last 5 years and hope to see many of you join us in the celebration February 14th. Beer will be drank, laughs and stories will be shared, and we’ll raise a glass to many more years of creating local beer.